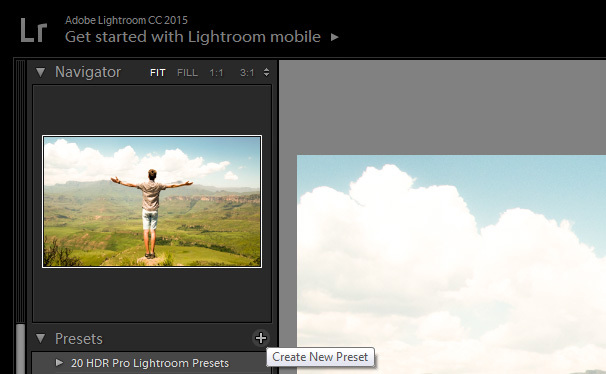 New in Adobe Lightroom? Want to make the most out of Lightroom’s features, but don’t have the time to read the 299 page manual? We’re here to help. 3 3. Smart Collections- How Do They Work? A great program comes in with built-in shortcut keys that benefit the user, and the Lightroom is no exception. You can save time on your work and do it in just one or two key presses instead of a 3 or 4-step process. Take the time to learn and practice the keys for maximum efficiency. Click on Help, then Library Module Shortcuts to access the Shortcut Keys. Or, hit the CMD/CTRL and the / to make it come up quickly. The num keys 6 through 9 adds color labels. The num keys 1 through 5 adds number of stars. Press U to remove the image’s flag, or to skip images. Press P to flag one image as pick. Auto Advance is one of the best workflow tips you can use in Lightroom. Using this will allow you to move rapidly through shoots while giving you the luxury to keep your fingers on the metadata keys when needed. If you forget to press the Caps Lock, or if you aren’t comfortable with it, you can use the next best thing- click on Auto Advance by going to the Photo, then Auto Advance menu. This feature isn’t turned on by default. Users must have it switched on when they open the program. What this does is allow the user to get on to the next image automatically as soon as the current image is given a rating. 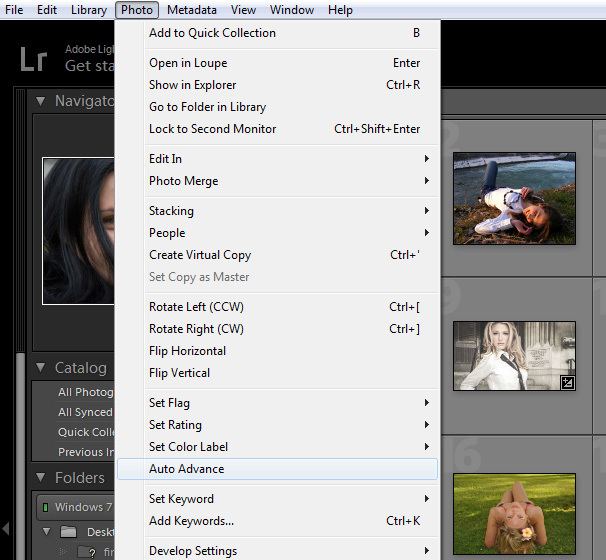 Adobe Lightroom lets the user rate images on a number of options. You’ve got the X for Reject and the P for Pick, and the color labels and the star ratings for more complicated selections. This is done for the purpose of filtering out the images that you want to use from the ones that you don’t want. Activate the shortcut by finding the Flag filter icon located at the bottom right corner of your Develop or Library module. This handy button will also let you see only the images that you have selected as the good ones. You’ll come across photos that will look very similar. What you can do here is to highlight all of them and press N to go into Survey Mode. All your highlighted photos will now appear all at once in the main window. This makes it easier for you to pick the best one in the group. You may be the type of person who gets distracted by a messy workspace. In Lightroom, you can effectively drop any unnecessary window that you’re currently not working on by right-clicking on the drop-down tab and selecting Solo Mode. Now, the only tab that’s visible will be the one you’re working on. 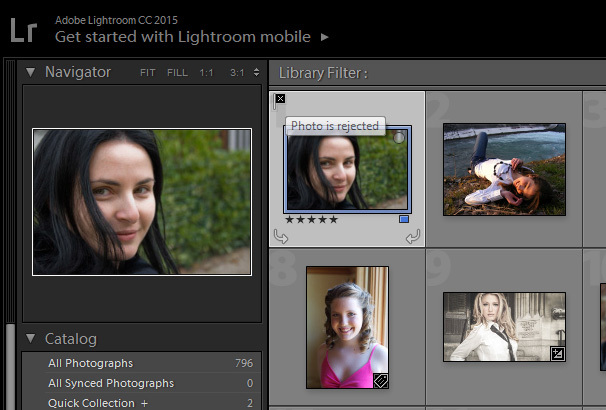 It can be tough for users to work on their Lightroom workflows when they’re using limited screen space. When this happens, you’ll need to find the balance between having the right controls in play without hampering the images you’re working on. There’s a way to auto-hide the panels. Simply right click the filmstrip at the bottom of Lightroom and then pick “Auto Hide and Show”. Voila! The panels will be hidden, which gives you more premium real estate for your images. Seeing the panels is as simply as hovering your mouse to them. 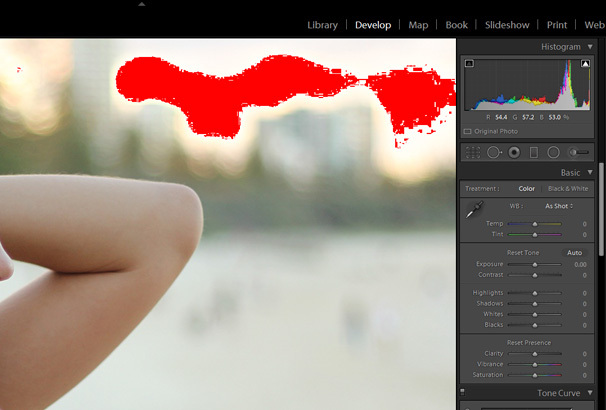 Do you need to really concentrate for a short time and not see the Lightroom interface? Easy. Use the built-in Lights Out Mode for a distraction-free workspace. Get to the Lights Out Mode by pressing the L key while you’re in the Library Module. All the surrounding area dims, leaving you with just your image. Tap the dark area one more time, and you’ll blacken everything else but the image. Third time resets it to default. The good thing about Lights Out is that you can use it for grid or single image view. This is a really useful tip for when you need to really get into an image. 3. Smart Collections- How Do They Work? Lightroom’s Smart Collections is a series of folders that are auto-filled with images that match certain parameters. It shines in applications where you need an updated portfolio showcasing your very best and most recent work. Begin by clicking on the + icon located in the Collections tab when you enter the Library Module. A new window and dialog box appears. This is where you can set rules and preferences, for example if you rate an image with 5 stars, that photo automatically be sent to the Smart Collections folder. When you’re working on a shoot and wish to put a particular image in your Smart Collections, all you have to do is to hit the num 5 key and they will be copied to the appropriate Smart Collection folder. It’s quite simple, yet effective. How about using the Smart Collections to make easy and attractive slideshows? To do this, all you need is to click on the Smart Collection and head on to the upper right part of the tab. There’s an option to enter the Slideshow Module. All your images will be added into the slideshow format. You’ll also get a plethora of edit tools you can use- add music, text or change the styling to match your preferences. Preview the slideshow, then have it exported at high resolutions in a compatible mp4 format. Clipping happens when a photo loses shadow detail or its highlights. When a photo is edited far beyond post production, it can result in blown out images and bland shadows that don’t have any detail. It could happen during a shoot via overexposure or underexposure, but what many don’t know is that it could happen in the post-production workflow as well. How does a Lightroom user avoid the damage and the trouble of clipping? Easy. All you have to do is press the J key when you’re in the Develop Module. You can also click on the Histogram’s triangle icons in the upper right side of the tab to turn this nifty feature on. You’ll see some highlights that are shown in red- these are the ones that’ll be blown out. The blue highlights will mean that there will be a significant loss of shadow detail. You will have the ability to put the ranges back to normal to avoid disastrous peaking. Add your personal brand logo while working on Lightroom in just a few quick steps. Head to the “Edit” menu item, then click on Identity Plate Setup to begin. This will allow you to fully customize your virtual workspace. Click on the Identify Plate option, then choose “Personalized”. 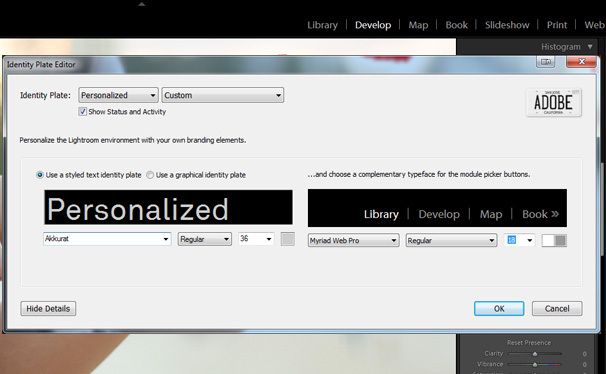 You’ll see 2 options to customize your identity plate. Tick on the box that says Styled Text to utilize the system fonts to embed your brand logo or name to the identity plate, or tick on the box that says Use Graphical Identity Plate to use a ready-made PNG image as your logo. Addding your own logo is a nice finishing touch if you use Lightroom to showcase your images to clients. Did you know that you can call up Crop Mode while working on a series of shoot in the Develop Module? All you have to do is press the R key while in develop mode. You’ll be surprised at the variety of different crop overlays available, or the number of grids you can put on top of your image as you crop it to perfection. Tap on the O key while on Crop mode to cycle through available crop options. The grids are there to primarily help you get creative with your photos. For starters, why not put the key elements of the image on intersecting lines to really capture your viewer’s attention? Are you tired of going through the motions each time you open Lightroom? We know how tiresome that is. Here’s a tip that will reduce all the clicking in a one-step action. Do the settings you need on any image. Then when you’re ready, simply hold the Alt key down and wait for it to change to the “Set Default” button. Confirm it and then agree to Update to Current Settings. Now you won’t have to go through the same old before you start editing. It automatically applies when you import photos for a hassle-free workflow! Lightroom presets are a valuable and time-saving feature, you can process a photo as required and then save the settings as a preset which you can then use on any future photos with the click of a button. Check all Develop settings you’d like included on your custom preset. Give it a name that fits, then press on the OK button. Default presets in Lightroom are great by themselves because you can just do a mouse click and your preferred styling will apply to the image(s). Over time, presets accumulate and turn into a disorganized mess. On Lightroom you will have the option to organize your presets in a drag and drop interface and put them in the appropriate folders. 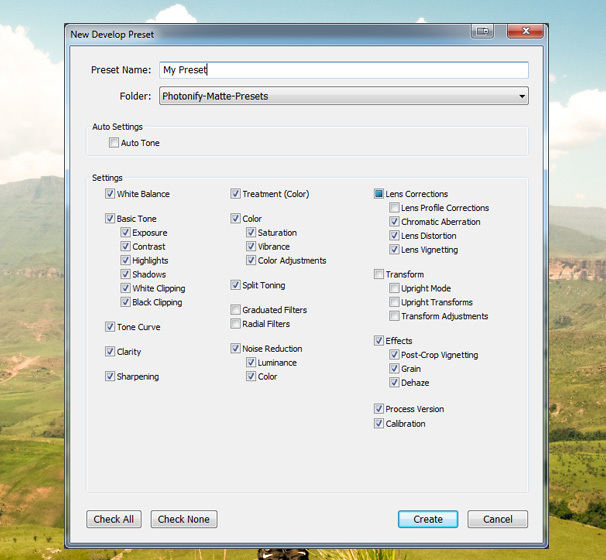 If you need a new folder, simply do a right click in the presets panel area and you’ll have a New Folder option. Give it a name, then organize accordingly. You can keep things simple here. Categorize according to black and white, film style, etc. You can put in a “Favorites” preset for your personalized styling that’s uniquely you. It’s awesome to have a large collection of presets, but don’t forget to tidy them every now and then. – See the Lightroom Preferences menu, then go to Performance tab. 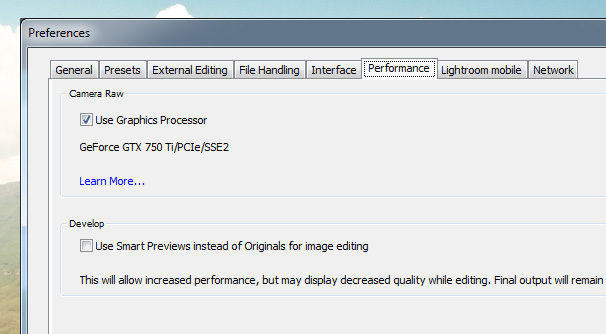 Tick the off switch on the “Use Graphics Processor” if you have an older PC or one that has an outdated GPU. – Get on the Preferences menu, then head to the File Handling tab. There’s an option to increase the size of your Raw Cache. Go ahead and crank it up to 30GB or more. – Run the File> Optimize Catalog option whenever you’ve just finished a really big project or every other week. Optimize your catalog and keep it running smoothly by going to File> Optimize. This should be your go-to option if you notice Lightroom falling behind on workflows. Smart Previews is a really nifty feature for editing smaller image files from the original raw images. Use Lightroom to edit your photos instead of calling up the original files from your external hard drive. Activate the feature by going to Preferences, then heading to the Performance tab. Tick the box that says “Smart Previews” instead of “Originals”. Enjoy editing while gaining a massive performance increase. Lightroom Mobile is a free program designed for photographers and professionals who are always on the go. It allows you to send image previews to your mobile tablet or phone and edit them right then and there. 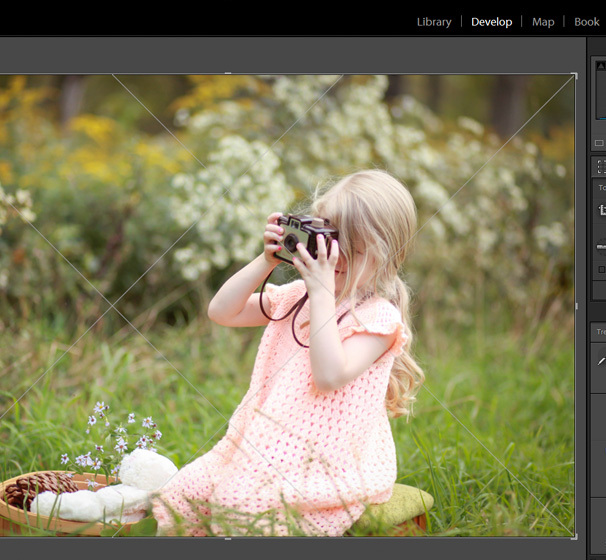 You can add presets, crop, adjust exposure and reject or pick images. The edits you can on your mobile phone will automatically be saved to your main computer for any final editing tasks. 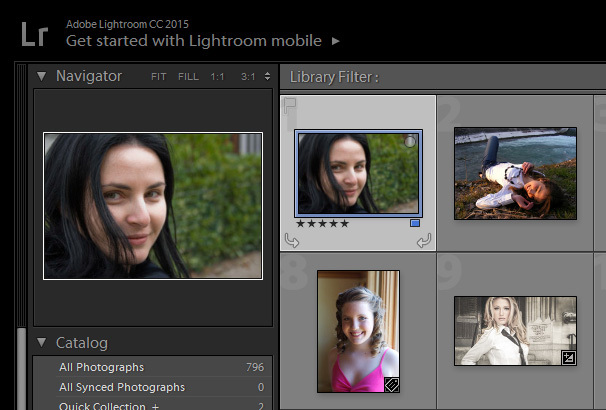 Lightroom Mobile is available to download for iPhone, iPad and Android devices. 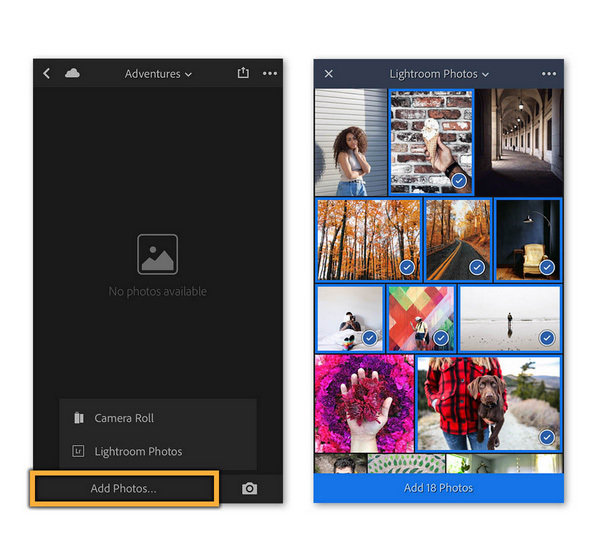 Lightroom Mobile is a free program designed for photographers and professionals who are always on the go. It allows you to send image previews to your mobile tablet or phone and edit them right then and there.